I LOVE this top! I’ve been admiring Sewaholic‘s designs for a while and am tempted by pretty much all of Tasia’s patterns. When I saw the Belcarra (beginner friendly) released and heard about the sew-along I knew this was the next top I wanted to try. Was pretty happy when I tried on my toile as the fit was generally good without any changes. The only problem was that it felt too tight across the shoulders to the point that I’d be unlikely to wear it. I searched for raglan sleeve broad should adjustments, but didn’t find anything helpful so I made a guess at what to do (you can see what I did here). I think it turned out quite well, the top certainly feels comfortable, although that could be due to the softer/drapier fabric used in the final version. I also narrowed the neckline by 1cm as per the instructions here. The fabric is a lovely soft viscose from Goldhawk Road. I brought this fabric on the recent NYlon meet up, it seemed to be one of the fabrics of the day as I meet quite a few other sewists who’d brought it too, look forward to seeing what they create with it! This was my first time sewing with viscose and I love it. Needs a little more care than cotton, but I love the softness and drape, definitely think it has worked well for this top. 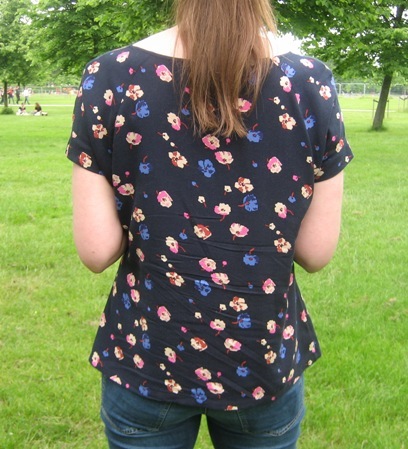 The top is quite straight forward to sew up, good instructions and the sew-along provides more details/photos. I did find the cuffs a bit tricky, so on the final version I hand basted them in place before sewing and was much happier with the result. I used French seams throughout, which even though there are curved seams worked well. 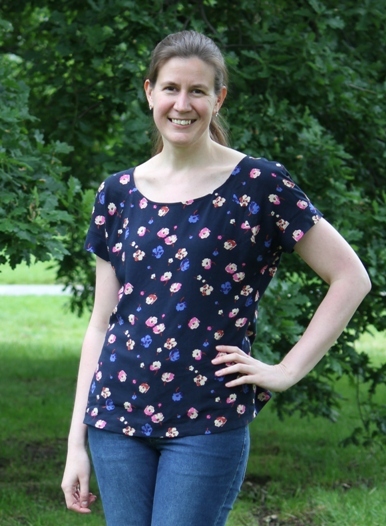 Please excuse the creases in the photos, I’d been wearing the top for a few hours before they were taken, will have to remember to think about that for future blog photos! 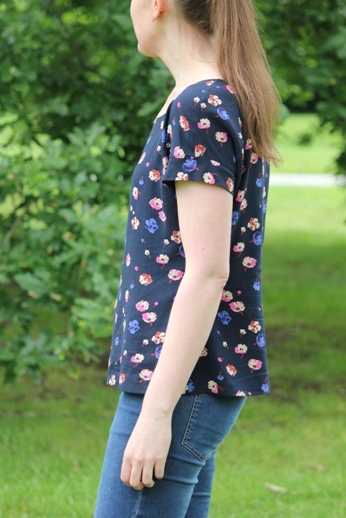 I’ll definitely be making some more versions of this top, just what I need for extending my summer wardrobe. 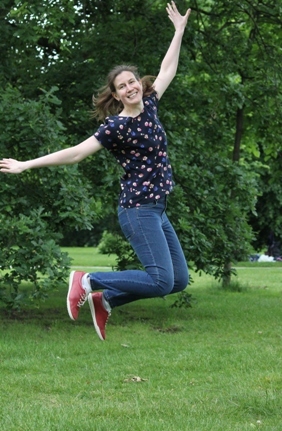 So happy with this top that I couldn’t resist a jumping photo! What a great little top Alex, glad you have found another wardrobe staple. It will be a great go-to pattern where you can use a massive variety of colours, fabrics and patterns to create a myriad of different looks. 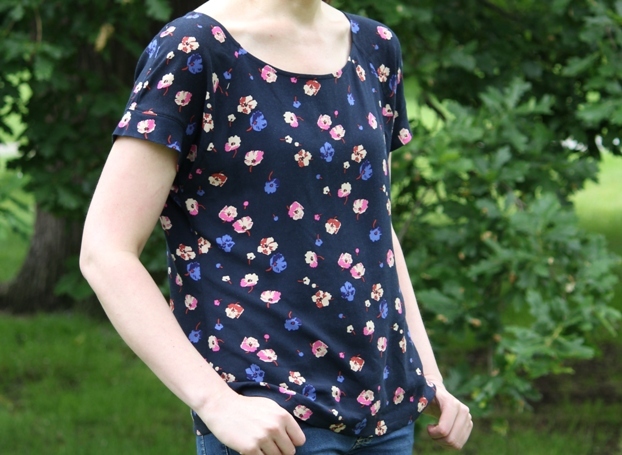 I purchased the PDF pattern of this whilst it was on the introductory offer price; although I currently have a huge backlog of sewing projects, so it may have to wait for a bit for me to get around to it. Thanks Caroline, I’m very happy with this pattern – have already started working on a second version! Now that I’ve found a staple pattern that fits I’m keen to do exactly as you say – experiment with a few different types of fabric to see and understand the effect. The PDF pattern is great value, especially while it was on the introductory offer. My printed pattern arrived on the very day that the PDF version was announced!